Posted on February 1, 2012, 3:09 pm, by admin, under New Projects, Recent News. 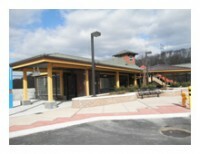 Cortlandt Station, a commuter train station on the Metro-North railroad from New York City, was recently renovated in 2009 with the addition of an extended overpass, new elevated waiting area, additional parking and access road, as well as a Clivus compost toilet system. The sewer was prohibitively expensive so the Clivus system was installed as a cost-effective solution. The restroom will be open to commuters in February 2012.